Powers/Abilities: Years of surgery filled Cybermancer's body with bio-bonded cybernetics, neural hand-wiring, virtual flesh and many other cybernetic implants. The implants enhanced her strength and durability to super-human levels. Although she was very intelligent and able to invent highly sophisticated technologies like the Cybermancer suit, she was also so obsessed with technology that she sacrificed her own humanity. The Cybermancer suit gave Suzi the ability of flight. The suit's sensors enabled her to detect any life form, energy flares or changes inside an unknown radius. The sensor's also enabled her to avoid several long distance attacks at the same time by calculating trajectories and arcs of incoming bullets/beams/rays to thirty decimal places. The suit possessed a hard-light cyber-cloak that could become as hard as Adamantium. Weapons included in the suit's gloves were E.C.M. drogues able to shut down any technology by siphoning the energy from it or stun living beings with an electrical shock. Also included were heat seeker missiles, hard-light knife-blade missiles and bombs. (Force Works#22 (fb) - BTS) - After her world's Kang had died in the "Great War" Cybermancer and her world's Tony Stark began to build a future based on Kang's ideas. They turned their sky black, the air became unbreathable and while artificial intelligences walked in flesh bodies grown in vets, men and women were turned into cyborgs. Cybermancer and her beloved Simon Williams were both turned into cyborgs through cybernetic surgery. Cybermancer worked together with her world's Tony Stark for over a decade. (Iron Man I#321 (fb) - BTS) - Cybermancer was brought to Earth-616 and became an agent of this world's Tony Stark. 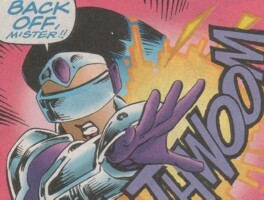 (Iron Man I#321) - Cybermancer observed her counterparts arrival at Los Angeles International Airport from the shadows. Meanwhile Iron Man contacted Force Works to plan Cybermancer's introduction. (Force Works#21 (fb) - BTS) - Cybermancer knocked out her counterpart and brought her to the Works' sub-basement where she was put into a cryogenic unit. (Force Works#17) - In the Works' Vroom Room Cybermancer trained against Iron Man and a hologram of U.S. Agent. The real U.S. Agent entered when Cybermancer killed the hologram and he didn't like what he saw. Iron Man told U.S. Agent and Scarlet Witch that Cybermancer would replace Century on the team. Five minutes later his decision was made official at a meeting with the whole team and their staff. Nobody liked Cybermancer's sudden entrance because she didn't go through the normal initiation process. After Iron Man showed footage that connected Hawkeye to Marilla's murder at Avengers Mansion Cybermancer proposed to hunt down Hawkeye on force, but Scarlet Witch overruled her and Iron Man's proposals. In late afternoon U.S. Agent met Hawkeye in San Diego, but Hawkeye fled when he saw Iron Man. Cybermancer already waited outside and nearly killed Hawkeye with an electrical blast. After that she joined Iron Man and U.S. Agent who returned with Hawkeye to the Works. Iron Man ordered her to secure Hawkeye when he was brought to the Works' infirmary. Later she tried to talk to U.S. Agent when he visited Hawkeye, but he didn't want to talk to her. (War Machine#20) - Cybermancer watched U.S. Agent arrive with James Rhodes at the Works and let them through to visit Hawkeye. When U.S. Agent returned later to bring Hawkeye away she attacked him. Rhodes entered the scene in his new armor and helped U.S. Agent against Cybermancer as War Machine. After a hard fight Cybermancer was knocked out by War Machine's gundogs. (Force Works#18) - Still angry about U.S. Agent's actions Cybermancer shouted at Amanda Chaney about what had happened. They changed topics and asked PLATO to find the Force Works Pegasus team, but they had dropped off PLATO's screens. Cybermancer asked if she should contact Iron Man and Amanda even wanted to go further and contact the Avengers. When PLATO told them that Force Works were heading to a mysterious area Moonraker referred to as Vietnam. Cybermancer and Amanda never heard of this land, but Rachel Carpenter did. Cybermancer contacted Iron Man while Amanda went with Rachel to check out her info about Vietnam. (Force Works#19) - Cybermancer helped Iron Man on his search for Rachel Carpenter in the Works. She registered an energy flare from the Chaos Vault and it was Century returning from space. Iron Man introduced him to Cybermancer. Rhodes arrived at the scene with Rachel and Cybermancer attacked Century after he had hit Iron Man because his repulsor was charged against Rhodes and Rachel. Century fought back and knocked Cybermancer to the ground. (War Machine#22) - Cybermancer attacked Century when he found Amanda Chaney's corpse in the sub-basement. None of her blasts could hit him because Century always teleported away. She activated a heat seeker and it locked on her when Century teleported away again. She aborted the heat seeker at the last second, but the distraction was enough to give Century the time to return and knock Cybermancer out. (Force Works#20) - After Iron Man had turned the Works into a death trap by activating "Defense Command Mordred" Cybermancer went to the console in the sub-basement from where she could control all the Works' security systems. She talked to the sub-basement's computer VIRGIL and told him that Force Works had no chance to survive. She activated hard light holograms to attack Force Works and prevent them from entering the spinal elevator. War Machine's remote units destroyed the holo-grid and Cybermancer decided to target her foes separately with the remaining laser emitters. Cybermancer watched how Fisher tested VIRGIL's auto-defenses with holograms. She left the control room when her readings showed her a thermal imbalance in the main cooling flue and ordered VIRGIL to target the Chaos Vault's environmental controls to drive Force Works out of there. In the cooling system Cybermancer found Spider-Woman and War Machine. She attacked them, but Spider-Woman fought back and knocked Cybermancer out. (Force Works#20 - BTS) - Cybermancer was locked up in specialized shackles used for super-powered beings. (Force Works#21 (fb) - BTS) - Cybermancer's home reality began to collapse. (Force Works#21) - U.S. Agent introduced Suzi Endo to her alternate future counterpart Cybermancer. U.S. Agent freed Cybermancer from her shackles and told her that he would bring her to the brig until the guys from the Vault arrive. Cybermancer told Suzi how she became what she was and that Suzi would go the same way. U.S. Agent locked her up in the brig, but a short time later Cybermancer's beloved Simon Williams freed her. He told her that their world was gone and that they had to live on this world from now on. Cybermancer was okay with this, but she wanted to get her suit back first. (Force Works#22) - Together with her world's Ultron and Wonder Man, Cybermancer went to the Works' research suite where her Cybermancer suit was kept, but it was gone. Cybermancer didn't want to leave without it and Ultron began an argument with her. Together they began to search for it and met Scarlet Witch and Century on their way. They offered them help, but Cybermancer told her partners not to trust her. Ultron held Cybermancer while Wonder Man told Scarlet Witch what Cybermancer and Stark had done to their world. 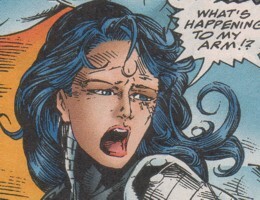 Suddenly Cybermancer's arms began to disintegrate and Suzi blamed Scarlet Witch. Wonder Man believed Cybermancer and attacked Scarlet Witch only to be stopped by Century. Cybermancer continued to disintegrate until she had vanished. After she was gone Force Works found out that all matter from her collapsing world was caught in its entropic field and degraded at the same rate. Suzi Endo returned Cybermancer's suit remote controlled to her counterpart's collapsing world which caused the time-gate to shut down. 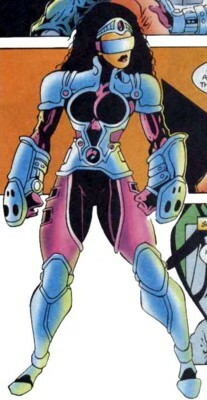 Suzi kept her counterpart's gauntlet she had used to return the suit and planned to explore it. Comments: Created by Terry Kavanagh, Heitor Oliveira, Marcos Tetelli, Mark McKenna in Iron Man I#321. Final look in Force Works#17 by Jim Cheung & Rey Garcia. It seemed as if Marvel was already planning for Onslaught at the end of Force Works. Cybermancer nearly dropped the name of a big threat Kang would've been able to stop or help against, but it was never said. Therefore the "Great War" on Earth-9528 could be the "Crossing" or any other event with Kang before another big one. It could even be an event with Kang that didn't occur on Earth-616 at all. Concerning the threat not really mentioned by Cybermancer: There are also many other great evils besides Onslaught that could've been stopped by a time-traveller like Kang. Just to name a few: Akhenaten, Immortus, Time-Keepers, Time-Twisters, and so on. Cybermancer's reality collapsed and it could be that the Heart of Forever had something to do with it. If the event leading to Earth-9528's divergence really was the "Crossing" it could've been that the Kang involved was just Immortus posing as Kang like on Earth-616, but this didn't necessarily had to be that way. Immortus and Kang both had access to the Heart of Forever at one point or another and Earth-9528 was an alternate future. Cyberiad, aka. Nathan Price @ Spider-Man and His Amazing Friends: "The X-Men Adventure"
He was Earth-9528's alternate future counterpart to Earth-616's Ultron. He was a techno-organic being that possessed super-human strength and durability. Ultron could cut through walls with his razor-sharp, metallic claws. (Force Works#22 (fb) - BTS) - Ultron advanced from just being a robot into a techno-organic being by gaining a flesh body grown in a vat. He worked for his world's Iron Man together with Wonder Man and Cybermancer. (Force Works#21 (fb) - BTS) - His reality collapsed and Ultron fled with Wonder Man through Stark's time-gate to Earth-616. (Force Works#21) - He entered together with his world's Wonder Man the Works through Stark's time-gate which Force Works brought from the sub-basement into the techlab. U.S. Agent and Spider-Woman fought him. Ultron began to bleed from his mouth which surprised U.S. Agent, because he only knew Ultron as a robot. Ultron defeated the heroes and then contacted Wonder Man to ask if he had found Cybermancer. Wonder Man did find her and told Ultron to follow his signal to join them in their search for Cybermancer's suit. (Force Works#22) - Ultron entered with his allies the research suite, but the Cybermancer suit wasn't there anymore. He nearly began a fight with Cybermancer, but Wonder Man stopped him. They continued their search and when Ultron saw the beautiful blue sky he became sentimental. Scarlet Witch and Century approached Cybermancer's team and Ultron held back Cybermancer to give Wonder Man the chance to tell their world's story. Ultron let Cybermancer go when she began to disintegrate. He tried to attack Century after he hit Wonder Man, but Century teleported away. Spider-Woman and U.S. Agent returned and Ultron was knocked to the ground by Spider-Woman and held down by Century who detected that Ultron started to manifest the strange energy decay as well. Century teleported Ultron, Wonder Man and Force Works back to the time-gate. Ultron vanished while Fisher explained the reason for the energy decay. 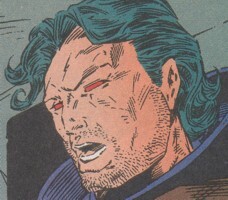 He was Earth-9528's alternate future counterpart to Earth-616's Simon Williams aka. Wonder Man. He seemingly possessed the same powers as Wonder Man from Earth-616. Additionally he was a cyborg with virtual flesh and many other cybernetic implants throughout his body. He wore a heavy armor and a helmet. He could emit unknown energy blasts from his hands, but it is unknown if it was a weapon in his armor or if it was a new power he gained through cybernetic implants. (Force Works#22 (fb) - BTS) - After his world's Scarlet Witch died, Wonder Man fell in love with Cybermancer. He was turned into a cyborg and worked for over a decade as a killer for his world's Tony Stark. (Force Works#21 (fb) - BTS) - His reality collapsed and Wonder Man fled with Ultron through Stark's time-gate to Earth-616. (Force Works#21) - Wonder Man entered the Works together with Ultron through Stark's time-gate which was brought to the techlab by Force Works. He hit Fisher and left to search for Cybermancer while Ultron took care of U.S. Agent. Wonder Man met Scarlet Witch and Century on his way and revealed who he really was. Scarlet Witch was happy to see him alive until she felt that his skin was cold. Wonder Man knocked her and Century out and continued his search. He found his beloved Cybermancer in a cell and freed her. After a kiss he went with her to find her suit and told Ultron to join them. (Force Works#22) - Wonder Man went with his team to the research suite, but Cybermancer's suit was gone. He stopped Ultron from hitting Cybermancer and told him not to be so emotional. Scarlet Witch offered them help and Wonder Man believed her. He told her his and his world's story, but when Cybermancer began to disintegrate he thought that it was Scarlet Witch's doing. Wonder Man tried to attack her, but Century and later U.S. Agent stopped him. Wonder Man cried out loud when Cybermancer finally disappeared and he wanted to know what had happened. Century detected the same energy decay hitting Ultron and teleported Wonder Man, Ultron and Force Works to the time-gate. Fisher explained to them why this was happening and after Ultron was gone too the energy decay began to disintegrate Wonder Man as well. Wonder Man returned through the gate to his collapsing world in an attempt to close it and it nearly worked.